SlugFest Games is excited to announce the upcoming release of The Red Dragon Inn: Battle for Greyport, a new cooperative deckbuilding game set in the fantasy world of The Red Dragon Inn! You and your friends will be rallying the people against dozens of different monsters as you make your way through the city of Greyport. Recruit powerful heroes to your deck and arm them with a variety of items all while leading the charge with your own unique character cards. Will you methodically eliminate your opponents one by one? Or throw caution to the wind and let fate decide the outcome with a roll of the dice and turn of a card? Either way, it will take the combined effort of each player to save the city… and the tavern! 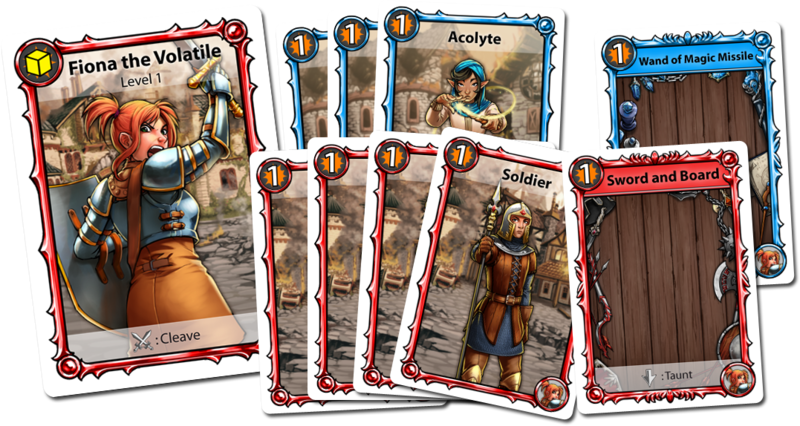 Each player begins the game with a deck of fresh-faced heroes as well as a couple of items and their first level character card. On a player’s turn, everyone attempts to slay the monsters attacking that player by playing a hero and equipping them with an item. Each item a hero is equipped with augments their damage and often provide them with new abilities. However, all of the pressure is on when the hero commits to a fight. After a hero starts a fight with another monster, they pick up their damage dice and leave everything to the luck of the roll. Deciding when to play it safe and take out a weaker monster you know you can slay versus shooting the moon and hoping to roll exceptionally will have tremendous consequences on the rest of the party. A hero can only fight one monster at a time, and in classic heroic fashion, the enemy is numerous and incredibly dangerous. That’s where your friends come in! One of the most exciting features of The Battle for Greyport is the lack of downtime between turns. Every turn, all of the players in the game get an opportunity to help out the active player in dealing with their group of monsters. Working with the other players and the heroes and items they bring to the table will be key to eliminating the toughest of monsters and reducing the amount of damage you will suffer. The key to victory will rest in how cooperative the players are with one another, because if anyone suffers a lethal attack, then the city is lost and everyone loses! Worgs and Trolls and Dragons, Oh My! Each time players defend Greyport, the experience will be different. There are a wide variety of different monsters and bosses to battle as well as locations to visit. With multiple scenario-driven game settings to play, players will be able to play dozens of times and continue to be introduced to new content, ways to win and ways to lose! Each boss provides a scenario with specific monster variety and challenges for the players. These scenarios take place across multiple encounters at different locations in the city, adding yet another level of intrigue to the game. A player with foresight will be able to make use of not only the advantages provided by the current encounter, but also the ones that are yet to come! 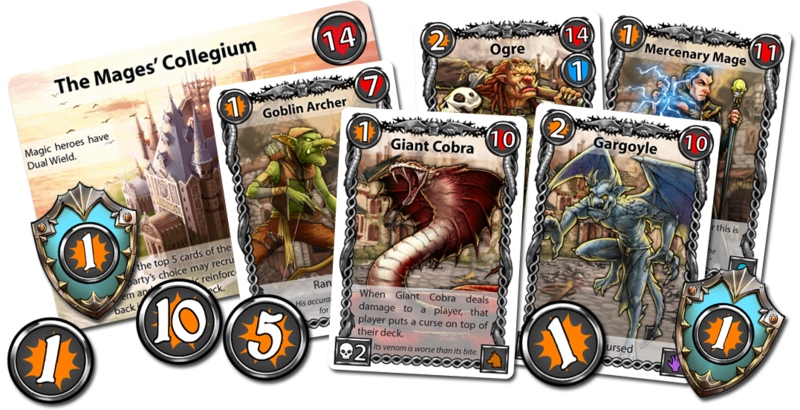 To help you battle the forces of evil, you will need to recruit powerful heroes and items to your deck of cards. Each encounter provides each player with a set number and quality of coin tokens. Each of these tokens is exchanged for a new hero or item that gets added directly to your hand. Many of these new cards will have immediate advantages that will have an immediate, massive impact on the game while others will have a more subtle, long-term effect on your whole game. Do you recruit the wild Barbarian who can slay both of the worgs in front of you, or do you take on the aid of the Collegium Archivist who will methodically improve your deck and dispel the curses you have collected from the nastiest of monsters? 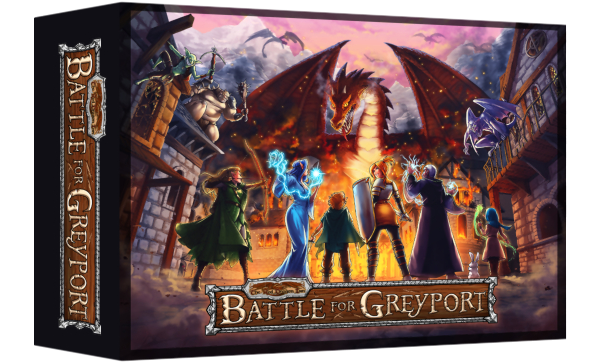 The Red Dragon Inn: Battle for Greyport has already successfully funded on Kickstarter. 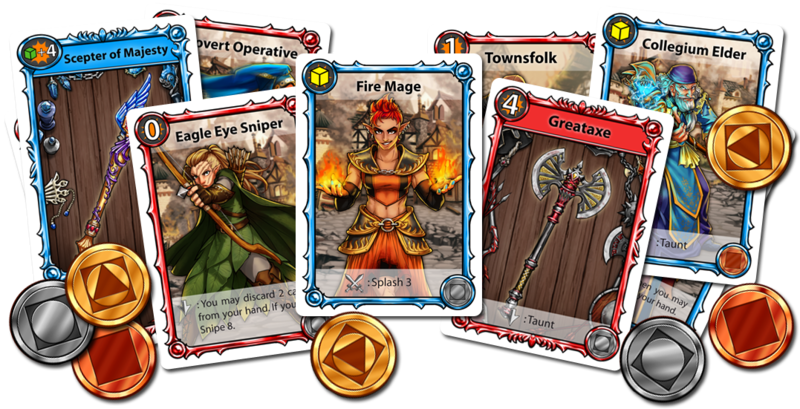 With only two days left in the campaign, many fans of deckbuilding games and The Red Dragon Inn have joined forces to unlock new monsters, bosses, locations, items and heroes. Everything achieved by the success of the Kickstarter campaign improves every copy of the game, with each bonus unlock becoming an “add-in” that is automatically included in the box! However, we are offering a Collector’s Edition of the game that will only be available through the Kickstarter, a brief post-Kickstarter pre-order period and select retailers while supplies last. You won’t want to miss out on bonus content like the poster, metal components by Campaign Coins, super-sized life counter dice and early access to promo drinks that won’t be available until 2017! We at SlugFest Games are thrilled by the success of the Kickstarter campaign and love the feedback we have received from players enjoying the [Preview Print and Play] we have made available. With your help we have made our game even better than we could have hoped for!